This is the most amazing story of our precious baby girls birth! I started to have contractions around 6pm on Sunday, May 13 which was Mother’s Day! While at dinner with my parents and brother they realized that my contractions were regular! They were all just staring at me like I was a bomb about to explode! When John and I got home around 9pm we called our midwife, Darlene, to let her know that the contractions were getting stronger. She said to try and relax and get some sleep, but to call if when my contractions were apart 5 minutes apart. So John and I pulled out the couch bed because it was too difficult for me to get in and out of our waterbed and we watched Mission Impossible: Ghost Protocol! I tried to relax and sleep but I just couldn’t get comfortable because the contractions seemed to be getting stronger. So I started walking around, sitting on the exercise ball, and relaxing in a warm bathto help with labor. At midnight we called Darlene because my contractions were 4.5-5 minutes apart! She said that she was going to load up her gear and head over! Then we called our moms so that they could help and support me! Once everyone got to our house John was able to get some much needed sleep because he knew that I was in good hands. I really LOVED being in the comfort of our home surrounded by my loved ones! I believe that being at home really helped me to relax! I was able to get into the best positions for laboring. Darlene made sure that I was drinking plenty of fluids like Gatorade, juice and water. She also made sure that I was getting protein shakes to help give me energy for delivery later. Ok so I’m not saying that labor and delivery was easy. It was difficult and painful, but all worth it! Going through this experience really opened my eyes to how much I really needed God to give me the strength to get through it. I have never prayed so much in my life! I needed the super natural strength that only God could give me because of being at home there were no drugs to take away the pain. I give God all the glory for bringing Skyler into the world. I would not have been able to do this without Him. I was also covered in prayer by our family and friends! I had John and our moms to encourage me the whole time. My labor was a long and hard 15 hours! When it was time to push I got into the tub, had a contraction and pushed and my water broke! So excited! It seemed to be taking a while so my midwife had me get out of the tub to check things out. There ended up being a small problem that she was able to fix and I got back into the tub about 30-45 minutes later. It took me about an hour to deliver Skyler. I felt like I wasn’t getting anything done but my support team kept encouraging me to keep pushing. I felt like the baby wasn’t moving at all, then finally the head started to come out and it seemed like it was taking FOREVER for the head to come out all the way! I have never had to push so hard in my life! When the baby’s head came out Darlene felt to see if the umbilical card was around the neck and it wasn’t so Darlene told John to get down there and catch his baby! John was so shocked that he was going to delivery that baby! He jumped in and felt the baby turn for the shoulders to come out and then I pushed again and out came the baby! John caught and brought the baby up to me! He looked and announced that we had a baby girl! We were so surprised and happy!! LiL Peanut was a girl!!! It was so AMAZING having John delivery our baby girl! 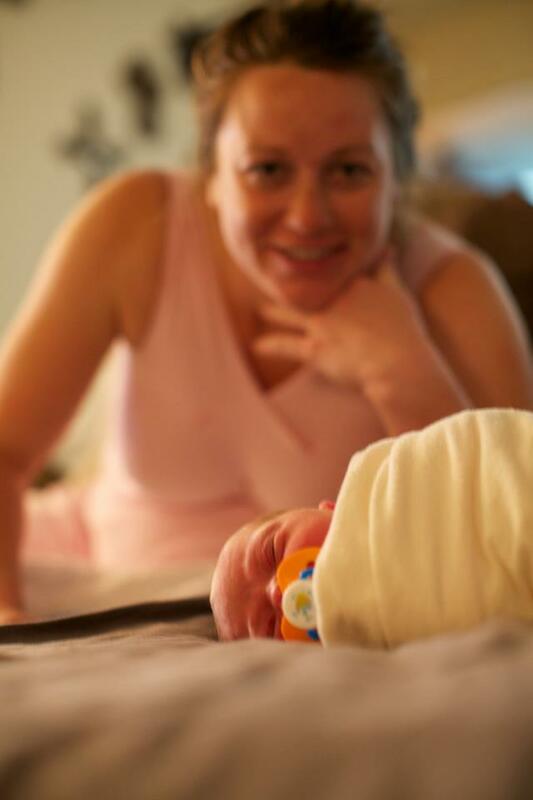 This home birth was the BEST experience EVER and we are looking forward to the next time! Our lives have been forever changed with our precious blessing from God born on Monday, May 14, 2012 at 12:10pm weighting in at 8lbs 8oz, 20.5 inches long and a 13.5 inch head: Skyler Justice Manigold!